Most of my childhood memories are episodic. I was young, second or third grade, when my mom took me over to one of her friend’s homes. Her friend had a daughter who was older than me — a middle schooler, maybe, or perhaps in high school — and spending time with her in her room was special to me. It was like having an older sister, something as an only child I’d always wanted but never had. I don’t recall us ever truly doing anything, but I remember being fascinated by the things she was into: pictures of cute boys from magazines taped onto her wall, tapestries hanging from the ceiling, recorded episodes of 90210 on VHS from the week before. 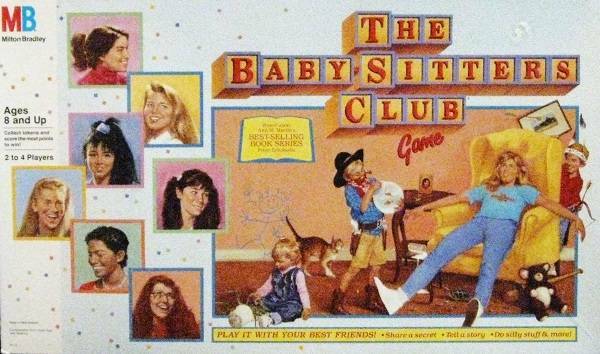 But one thing that she had that I coveted beyond measure was a copy of the Baby-Sitters Club board game. I begged her to play it each and every time I was over, and I’m sure she relented once or twice, though I can’t quite remember. What I can remember, though, is begging hard enough that she allowed me to borrow it from her. The terms of the borrowing are a bit fuzzy, though I’ll freely admit that she never got that game back from me. I don’t know if it was because I forgot about it or because I had no intention of returning it, or, perhaps most possibly, she’d completely forgotten it as she grew up and into other interests and passions. But I remember finding it in a big house cleaning before I went off to college and realizing that it became mine at some point along the way. I loved the game. I played it whenever I could, and I loved whenever my friends came over to my house, that I could present this as an option to spend time together. I usually played Stacey, though periodically, I’d also play Dawn. My childhood was all about the BSC, though before I dove head-first into it, I delighted in the series for younger readers, The Baby-Sitter’s Little Sister, featuring Karen, the younger stepsister of Kristy Thomas, BSC founder. Even though I was her age, I found Karen incredibly annoying and frustrating, but I identified with her quite a bit. Her parents were divorced, like mine, and she, like me, had to be shuffled between them, meaning that her life was regularly interrupted. Up until this point, I never knew anyone, real or in books, who had a life like mine, regularly moved from place to place, from parent to parent. As much as Karen could annoy me, I identified fiercely with that. It made me feel like my own two-parent, back-and-forth life was normal. But what Karen had was what I always wanted: sisters. Even when moving from the little house to the Big House, she had sisters around, and she freely admitted to loving Kristy especially. That older sister meant the world to her — she was a bit of a guide post, a mentor, and someone she could look up to. Kristy was a solid presence in her life, even if she wasn’t there with her every waking moment. I progressed to the BSC pretty young, since I blew through Karen’s stories at breakneck speed. I decided pretty swiftly which girls I loved and which ones didn’t hold my attention in the same way. If Stacey or Dawn or Claudia were the main character, I was 100% in on the book. Stacey, if you don’t recall, deals with parents who get divorced during the run of the series, and she was often put into the middle of arguments between them. While my own parents didn’t bicker with one another enough to put me between them, I did spend much of the time at my father’s house listening to him and my step-mother putting down my mom in ways that made no sense — why didn’t my mother give me hundreds of dollars to spend when we went on a trip to Disney, instead of just $20? (…because she couldn’t afford to). Dawn lived with a single parent, her mother. Even though I had the “privilege” of spending time with my other parent and his wife, the bulk of my time was spent in a single-parent household with my mother. My dad, despite having a custody arrangement, really wasn’t a parent to me. Dawn does visit her dad in California periodically, but he’s absent in her day-to-day life. As for Claudia, well, how can you not love a girl who embraces her sweet tooth and has a sense of style? Anyone who claims they didn’t adore her is liar. When Abby Stevenson moved to Stoneybrook and became a member of the BSC, I found myself really in love with her and her story. She had a twin sister, and she had no father in her life — he’d been killed in a car accident. There was something about her that immediately rang true to me, and her books were ones I returned to again and again. They were the ones I was most eager to grab from the shelf at Crown Books whenever they released. My mom would drive me there, let me loose in the book section, and I knew I could come back with one, maybe two, new paperbacks. They were always BSC titles. One of my fondest childhood memories — one I turn to again and again and realize set me on a course of loving books and reading — was when I got to meet the author of the BSC, Ann M. Martin. It was a rainy day, maybe in March or April, and I was in second grade. My friend, a redheaded girl named Lauren, had a mother who was always taking her and her little brother places. She’d gotten to do and see a lot of things I never got to, in part because my mom was a single parent who worked a lot and who worked some odd hours to make ends meet. But Lauren’s mother knew how much I loved the BSC, and she offered to take me with them to the bookstore to meet the author. The arrangement meant leaving school early, which we did, and I remember clearly that my mom gave me enough cash to buy a couple of paperbacks when I got there. It was special, being let out of school early, and when we arrived to a long line at the bookstore, it wasn’t a big deal at all. All of these kids — all of these girls, almost all around my age or even a little older — waiting in line to meet the creator of their favorite books. It was neat to be there with my own friend, too, talking about our favorite BSC members and how excited and nervous we were to meet the author of the books that had meant so much to us. I was too scared to say anything to her, but she signed my book and let me sneak behind her for a photo. We were in some big space — with, as it appears, antique fire trucks behind us — and a basket of fake fruit at the author table. But the smile on my face there says everything. I got to meet one of my heroines, a writer who created a series that spoke to me in a way no books had ever spoken to me before. That normalized my own growing-up experience between two parents. What these books did was offer me the sisters I never had. They were my best friends, but more, they were my sisters. I connected with them, and I lived and breathed their stories and adventures in the same way I would were I the younger sister of an older, wiser, more experienced sister. When I had no one to look up to and no one I felt like “got” who I was or the place I was at in the world, I had to do little more than open up the pages of a BSC book and remember that there were other girls in the world who had divorced parents, who felt alone, who struggled with being perfectionists or creative. These were things I never got to see first-hand because it was me and only me. These books taught me at a young age how much girls’ stories matter, as well as how much it matters to show sisterly love to other girls around you. You can fight, you can argue, and you can disagree with one another — hell you can dislike one another with passion — but what mattered at the end of the day was respect. You love each girl like she’s your sister, like she has a big, complicated story to who she is, and you’ll find the same thing offered back to you in return.